What says “fall” more than a pumpkin spiced treat? One with pumpkin AND apple, of course!! This week, I’m taking a little break from layer cakes to finally bring another cupcake recipe to the blog. The cupcake section of my recipe archives is embarrassingly lacking, so I’ll be solving that problem over the next couple weeks! In other exciting blog news, I’ll be doing a little mini-makeover on the blog in the next week or so, and I’m really excited about it!! The site may be down for a few hours while I update everything, but I promise I’ll have it back up and running as soon as possible. Don’t be surprised if things look a little different next time you stop by. I hope you will enjoy the new look! 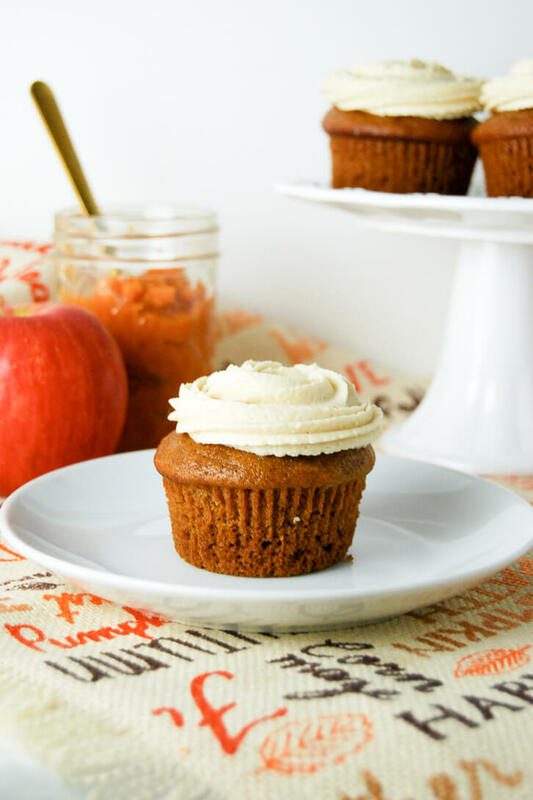 Now, about these pumpkin apple cupcakes. Of course, layer cakes are my thing, but having some good cupcake recipes up your sleeve is never a bad idea. Especially when you need to put something together a little more quickly. For example, when you get home from the airport at 9PM after a week out of town and need to bake something ASAP (this exact situation may or may not have happened to me last Thursday….). Since I get so excited each fall about baking with apples and pumpkin, I inevitably started thinking about combining both these classic fall flavors. And that’s how this cupcake recipe came to be. Two birds, one stone, am I right? I originally thought about adding diced apples, like in my walnut apple cake recipe. However, I ultimately decided to go with a smoother batter for these pumpkin apple cupcakes, which is what I typically prefer when it comes to cupcakes. So instead of diced apples, this recipe calls for apple butter. Together with the pumpkin puree, it blends in to the batter seamlessly. Whatever frosting you choose, these cupcakes are sure to be a hit. I even made a double batch of them! If you do make this recipe, don’t forget to share with me on Instagram by tagging @flourcoveredapron! Preheat oven to 375 degrees Fahrenheit and prepare cupcake tin with cupcake liners. This recipe makes about 14 cupcakes. Whisk together dry ingredients (flour, baking powder, baking soda, salt, and spices) in a large bowl. In a medium size bowl, whisk together the oil with both sugars. Then, beat in eggs one at a time. Add pumpkin puree, apple butter, milk, and vanilla, then whisk until combined. Pour wet ingredients into the dry ingredients and fold until combined. Divide batter evenly among cupcake tins - my batch made 14 cupcakes. Bake at 375 degrees for 12 minutes, then lower temperature to 350 degrees. Bake for an additional 4-6 minutes, or until cupcakes pass the toothpick test. Let cool in pan for about 5 minutes, then transfer cupcakes to a wire rack to cool completely. Using an electric mixer, cream together butter and brown sugar on medium-high speed until light and fluffy. Add powdered sugar gradually, mixing on low speed until combined. Add salt, vanilla, milk and cinnamon (if using). Mix to combine, then beat until frosting is light and fluffy. Fill a pastry bag fitted with a large, open star tip with frosting and frost cupcakes as desired. Oh my gosh, I could use one (or 4) of these right now. The perfect fall treat!! What is apple butter please? Can I make it? Hi Amie, apple butter is kind of like a very concentrated apple sauce. You could look up a recipe for it online if you’d like to make it yourself. Personally, I usually buy it, I’ve been able to find it at most grocery stores.